First of all it should be said that the winter plumage changes to bright yellow only in spring – we all know why. The male bird’s head and undersides are yellow, the back brown and a sure identification sign is the rust-coloured top side of the tail. Females and young birds have a duller colouring and there is less of the yellow colour. Yellowhammers have a placid behaviour, on the ground they seem somehow clumsy or inept. They are not particularly afraid of people, move in groups and some little internal bickering goes with their life style. They prefer feeding on the ground as can be seen in the Forest Camera; in winter they also visit bird feeders in villages and other communities. 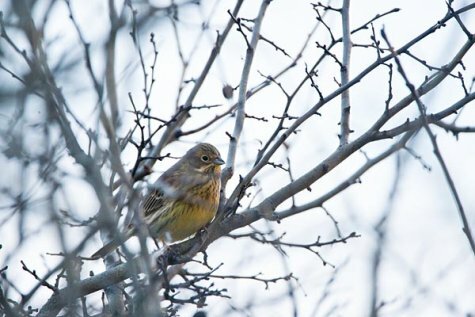 Some of the birds that nest in Estonia migrate towards south but during winter the number of yellowhammers reaches a couple of hundred thousand individuals thanks to the immigrants.